In Cairns, on the northeast coast of Australia, we made our first dive-related purchase — masks and snorkels. Mine are in white, and make me think of A Clockwork Orange somehow. We also attended a "Reef Teach" lecture on the flora and fauna of the reef, taught by the bizarrely theatrical, yet incredibly informative Paddy. The next day, we boarded a Pro-Dive live-aboard dive boat for a three day adventure on the Great Barrier Reef. The boat was very comfortable, and with a good set of people. The three hour ride to the reef was incredibly choppy, and most were feeling queasy on arrival. While at the reef, Jason and I did our first unguided dives together, some more successful than others. 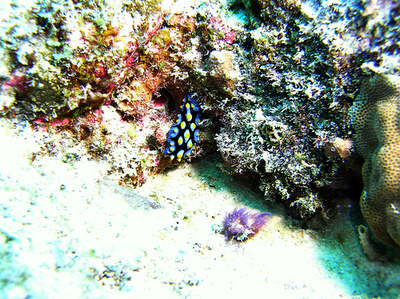 We saw some interesting fish, yet the reef seemed rather dead in some areas. We also tried night diving for the first time, and really enjoyed the feeling of floating in outer space. Many large red cod were out at night. There were multiple types of Clown-fish (Nemo) on the reef. 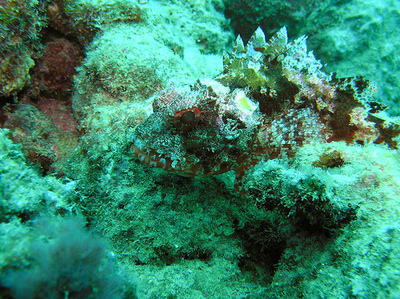 Lion-Fish (or Scorpion-Fish) were well camouflaged. At one point, Jason and I were trying to navigate around a big coral formation and find the "swim through" to get back to the boat. We didn’t find it, and figured we’d swim over the top of the formation. 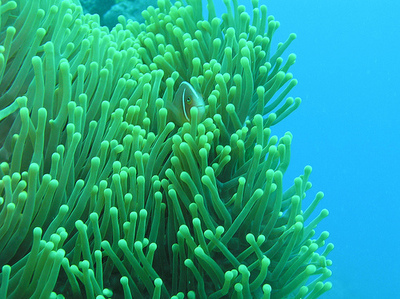 Unfortunately, the flattish top of the coral was quite broad, and was only about three feet away from the roiling surface of the sea. We were churned around up there, and struggled to get back to the boat. It was exhausting. After a struggle, we finally cleared the coral. Now we know why it’s called a swim through. Not to be repeated. "But are you sure we passed this coral?" 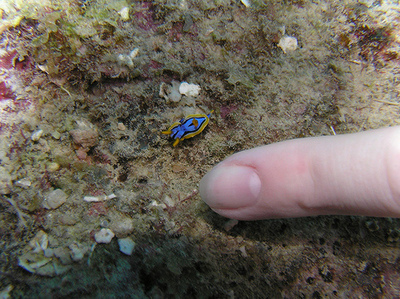 We spotted a few nudibranches (tiny colorful slugs), a sign we were improving — diving slowly and observantly. 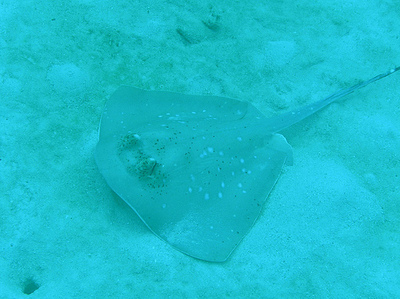 There were a few rays in the reefs too. We could see the Opera House from the window as our plane approached Sydney. Temperatures were somewhat cooler than in Alice. We got to our hostel in time for dinner in Chinatown. The next day, we met up with our friends, Savvy and Chris, who we met in Vientiane, Laos. We checked out some of downtown Syney, and went to the Contemporary Art Museum. We perused a Sam Taylor-Wood show, an exhibit called "Masquerade," and a permanent exhibit of modern Aboriginal works. My favorite pieces were the "Adventure Series" by Tracey Moffat. We also enjoyed seeing some of Cindy Sherman’s predecessors and contemporaries in Masquerade. I wasn’t aware there was such a tradition of photographic self-portraiture involving elaborate costumes and sets. While in town, we noticed these terns, which apparently feed on garbage. They look kind of Edward Gorey. I spent one day shopping along Oxford Street, a long avenue of Soho-like shops and boutiques. The weather never really cooperated with us in Sydney. One day, we did the "Bridge Climb," which entails climbing the Harbor Bridge. Apparently, it’s the only large bridge you can climb. Before "suiting up," we saw autographed photos of a melange of celebrities including Chelsea Clinton, Frankie Muniz and Pamela Anderson atop the bridge. Though we’d only recently heard of the Bridge Climb, many in our group had been thinking of doing it for years, and were very nervous. We were put into some rather foul outfits — jumpsuits with belts that clip onto a wire that keeps you from falling. After a brief training session, we began our ascent of the bridge. It was actually rather tame; I’d been looking forward to some rappelling, but that wasn’t included. We traversed stairways, catwalks and inclines to the top of the bridge. The Climb was really fabulous — the harbor views were great, but cameras weren’t allowed. One could see lots of inlets and islands, and what looked like a regatta of sailboats — they love to sail in Sydney. There were several business centers with skyscrapers scattered around the inlets. 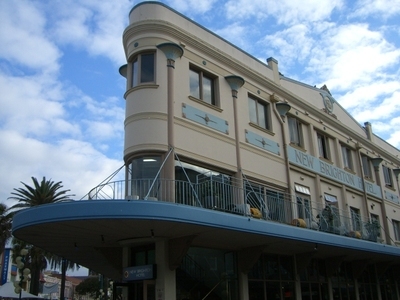 And, of course, the Opera House was the gem of the harbor. That afternoon, we wandered around "The Rocks," the charming neighborhood at the base of the bridge. 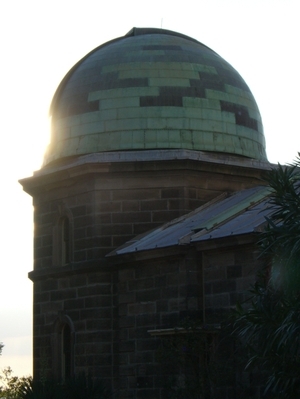 We also saw a lovely old observatory. Another day, we took a ferry to Manly Beach, one Sydney’s loveliest. Apparently, it’s called "Manly" because, as he arrived at the beach in 1788, Governor Arthur Phillip was struck by the manliness of the local Aborigines. Hmmm. Though it was chilly, the surfers were out. We wished the weather was warm enough to swim. 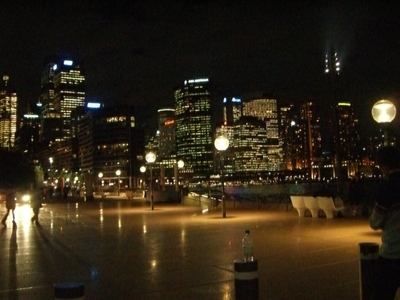 Nonetheless, gorgeous beaches and comfortable neighborhoods made the Sydney lifestyle look very tempting. 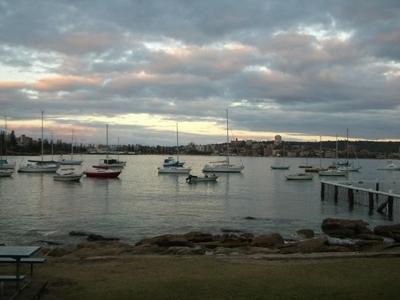 We did part of the "Manly Scenic Walk" along the shore, and considered knocking on several doors to ask, "How much?" It must be amazing in the summertime. 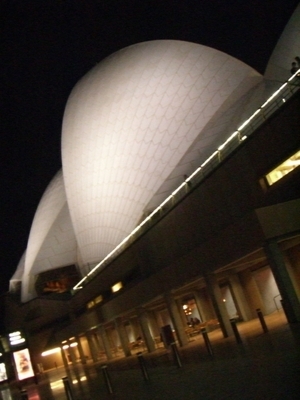 That evening, we took in a performance at the Opera House. While in Sydney, we never saw the Opera House gleaming in the sun, like it is in most photos. The weather was cloudy for much of our stay. But it was lovely to see the hemispheres glowing in the night sky. Up close, you can see a herringbone structure to the brickwork that isn’t always apparent in photographs. The Opera House is just as wonderful as I thought it would be. It’s hard to imagine the it was built in the ’50s, as it truly transcends eras or styles, and appeals to many. The performance we saw that evening was "Ruby’s Story," about an Aboriginal woman’s life. She was part of the "lost generation," who were taken away from their parents and fostered out. 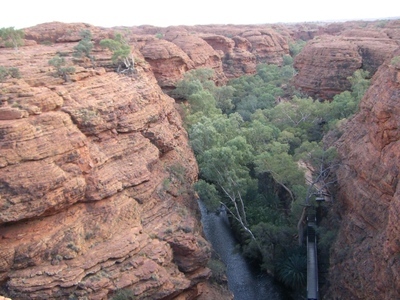 The government thought this was a way to correct perceived social ills in aboriginal communities. It was a traumatic event for many involved. Before leaving, we spent about a day doing chores — errand-running, hair appointments, chiropractor, and planning for Cairns. 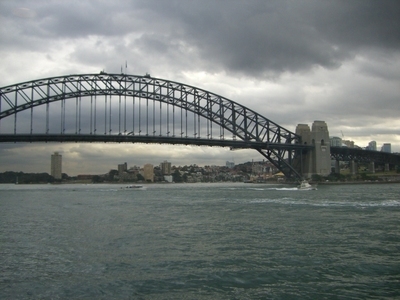 Despite the grey weather, we had a great time in Sydney, and can’t wait to come back. 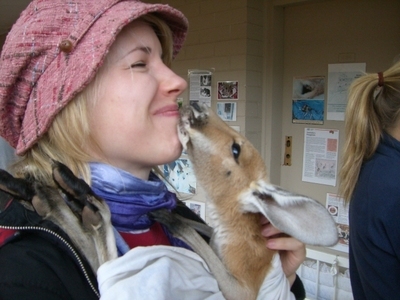 In Alice Springs, we had an amazing experience — cuddling orphaned baby kangaroos. Kangaroos are very common in Australia, and are often hit by cars. Many people don’t realize that the joey can still be alive in the pouch after the kangaroo is hit. 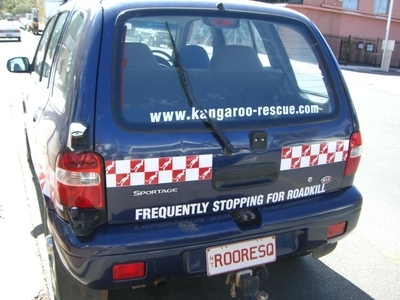 This organization urges people to check the pouches of dead kangaroos hit by cars, and to rescue any live joeys. The joeys aren’t dangerous at all, and won’t bite. So, on the off chance that you find an orphaned joey, put it in your lap, or under your shirt while you’re driving, and call the Kangaroo Rescue Center for pickup. 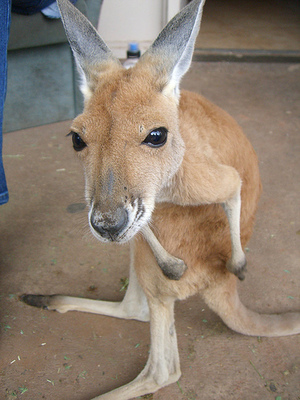 The joeys we held were adorable, with their over-sized eyes and ears. They licked our noses as we held them in simulated pouches, spindly legs and tail sticking out. Their tails were velvety and squishy. 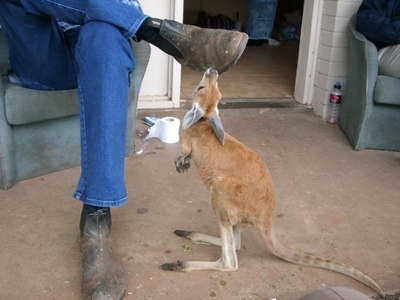 One of the caretakers bottle-fed the ‘roos, and another held a "pinky," a young joey with no hair. 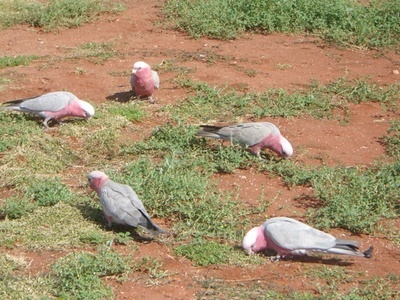 At one point, it was time for the ‘roos to exercise — to jump around outside the pouches for a few minutes. The whole experience was just amazing, and I got my cuddly animal fix. 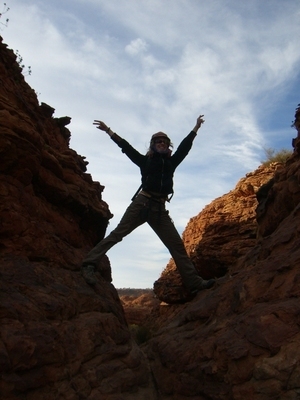 Alice Springs itself was great, and we wished we had more time. It felt a like a smaller, less frequented Boulder, Colorado in some ways. The population is only 27,000, but it feels somewhat cosmopolitan, as people are always coming and going. The food was good too. 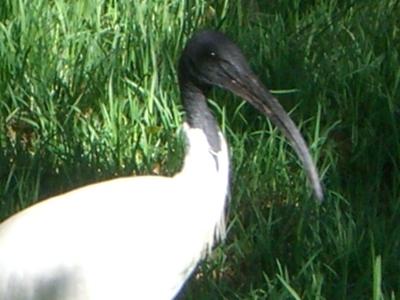 And the Alice Springs Desert Park was wonderful. 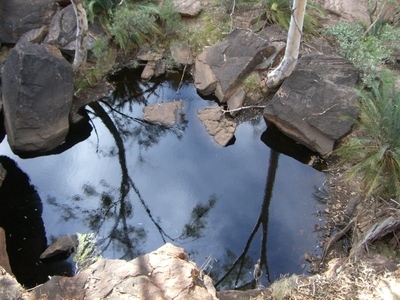 It’s mostly an outdoor experience, where you walk through the bush and see some of the local flora and fauna. 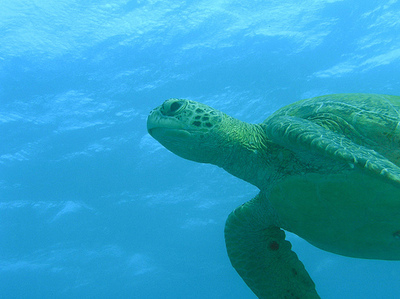 Lots of animals have highly specialized adaptations for the extreme desert climate. For example, there are frogs and fish that can survive in damp areas underground for years, until a rainfall. We hadn’t realized how big cockatoos are. 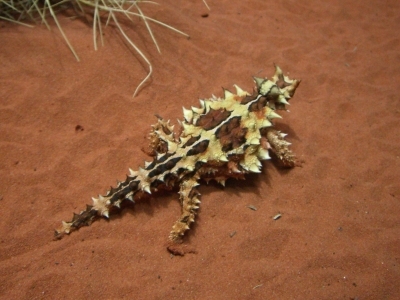 We finally saw a Thorny Devil, as our group hadn’t found one in the wild. The nocturnal exhibit, with mysterious small marsupials, toads, bats and snakes. And the real highlight was an open air birds of prey show, featuring large hawks and eagles. In an unscripted moment, two of the park’s giant Wedgetail Eagles fought with an eagle from outside the park. 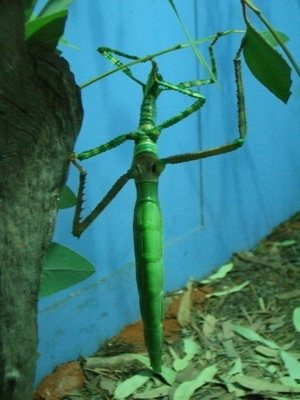 The prehistoric-looking Goliath Stick Insect was literally bigger than my hand! You are looking at a foot-long bug. We also enjoyed the Aboriginal art galleries in Alice, and bought a painting. Some of the motifs are really wonderful, and I’m surprised they don’t have wider exposure in the U.S.
I’ve been reading "The Art of Travel," by Alain de Botton, which is, incidentally, a great book. Concepts in the book have corresponded in poignant ways to our journey. He discusses the idea of the sublime in western perception of landscapes, starting in the mid-eighteenth century. It reminded me of some wonderful college courses I’d taken on landscape painting and history of the same era, taught by Prof. Henry Sayre. Scientific discoveries on evolution and the formation of landscapes during that era corresponded with the "sublime landscape." People felt a new mastery over the land, and over some of the mysteries of life. As a result, some began to question their religious beliefs. And for some, religious awe was transferred to nature, and the wonder of the landscape, and of nature’s creation — the forest as cathedral. Hence the interest in the sublime landscape — a landscape they felt, despite their knowledge, was overwhelming, and more ancient and inscrutable than humans could fathom. Places like Uluru feel this way. They briefly make you indifferent to human concerns — make you realize you’re just a blink in the metaphorical eye of the universe. The era’s new-found awe for the scarier bits of nature resulted in paintings that broke out of the traditional, calm pastoral landscape style. The majestic North and South American landscapes of Frederic Church, or the tumultuous seascapes of Joseph Turner fall into this new category of landscape. I’m negligent in knowing whether Australia has a similar tradition, but the landscape is certainly deserving. "The Art of Travel" also discusses Wordsworth’s belief in the restorative powers of nature. Seeing this much countryside, without much evidence of human existence, definitely gives a feeling of calm. It allows one to follow trains of thoughts that just wouldn’t happen on the New York subway. Also mentioned in "Art of Travel" is Ruskin’s belief in the power of drawing to help you see — that it’s not about creating an amazing drawing, but rather, to be able to observe the subtle lichens growing on the red rock that the non-drawer wouldn’t notice. I’m now aching to draw. I think less literal forms of creation — compositional or abstract — can be just as good for the mind — perhaps they’re more about observation of internal ideas and connections than the external. The panorama we encountered several days before was also adjacent to this general set of ideas. The medium of the panorama was discussed in those college art history classes. In addition to traditional paintings, and devices like the stereoscope, panoramas were expressions of people’s new-found interest in the sublime. They gave a visual idea of the new and exciting frontier, a sometimes fictional majestic landscape. They were also a form of pre-television entertainment. After getting up at a leisurely 6am, we cleared out. We stopped at Kings Canyon for the last hike of the trip. It another day of beautiful scenery in the desert. 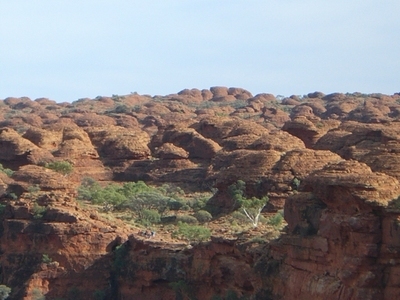 Muscular rounded rock formations look like brick domes or beehives. And there’s an oasis; a deep, rugged gorge cut by a stream, filled with plant life. Cycads, an ancient form of palm tree from the dinosaur days, thrive there — some are a thousand years old, but they look like they could have grown in a year to my eye. 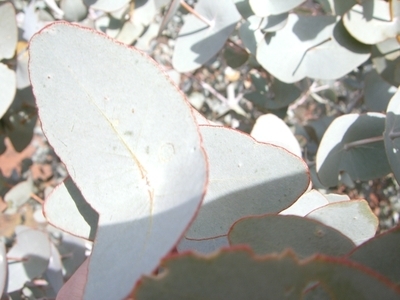 The little valley of green is a rarity in the harsh, dry bush. 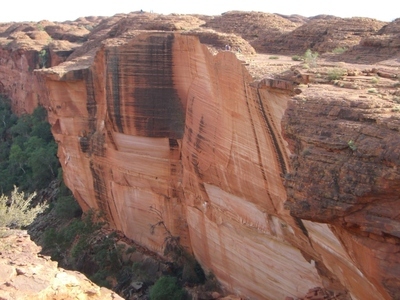 You can see layers of stone from the ice age(s) on massive sliced cliff-sides. We saw some parrots near our lunch site. After stretching our legs, we got back on the bus for several hours. 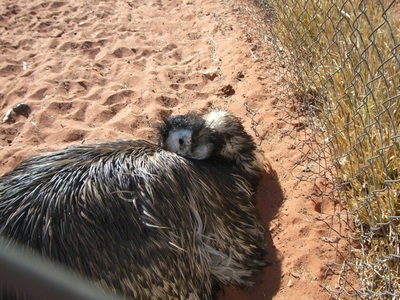 We stopped at the giant echidna roadhouse again, where I saw this emu resting. 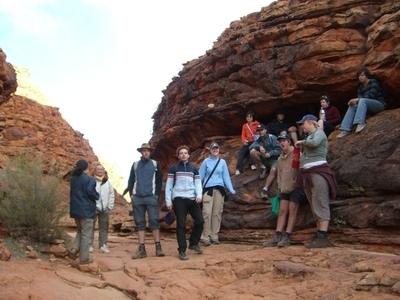 Then we drove several hours to Alice Springs, the end-point of our outback adventure. That night, the group had one last dinner together.